Nikon were one of the last major camera maker’s to introduce a mirrorless model and while the Nikon 1 V1 garnered praise initially later models from the firm failed to induce the same levels of curiosity. Fast-forward to the AW1 and Nikon has clearly given the system a new lease of life. The AW1 borrows on the internal components of the land-based Nikon 1 system with its 14.2-Mpix 1-inch type (13.2mm x 8.8mm) CMOS complete with fast focusing from its hybrid AF system and wraps it in a freeze-proof, shockproof and fully submersible shell. Sealed and lockable covers care adopted for the various compartments while to the rear the AW1 has a 3-inch 921-k dot LCD. The camera has an innovative range of motion sensing functions, allowing certain features to be selected more easily when submersed or if using with mittens or gloves in the cold. Full-time AF is possible at full resolution at up to 15fps, or 60fps without AF. Like it siblings, the AW1 also has Full HD video recording at 60/30fps in MOV (H.264/MPEG-4) with stereo and even has a pop-up waterproof flash, though that’s only for stills. Naturally enough you can’t have a submersible camera without suitably equipped lenses, and Nikon has introduced two dedicated lenses, a 10mm and an 11-27.5mm zoom. When fitted, the AW1 is waterproof down to 15m, a lot less than the firm’s no longer-made Nikonos system but useful nonetheless. While the AW1 and 1 Nikkor AW lenses adopt a new waterproof mount with heavy-duty O-ring sealing, the firm’s existing 1 Nikkor lenses may also be used, but, naturally, only on land. The Nikon AW1 is available now in black, white or silver at $799 complete with the new 1 Nikkor AW 11-27.5 f3.5-5.6 zoom. 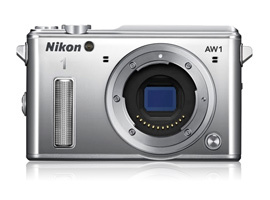 The Nikon 1 AW1 attains a DxOMark a score of 51 points and a global ranking of 197 overall. That’s behind the 1-inch format 20-Mpix Sony Cyber-shot DSC-RX100 at 66 points, Nikon 1 J3 at 52 points and the 1/1.7-inch type 12-Mpix Nikon Coolpix P7700 with 53 points, and in front of the Nikon 1 V2 and old APS-C Nikon D70s DSLR, both with 50 points. 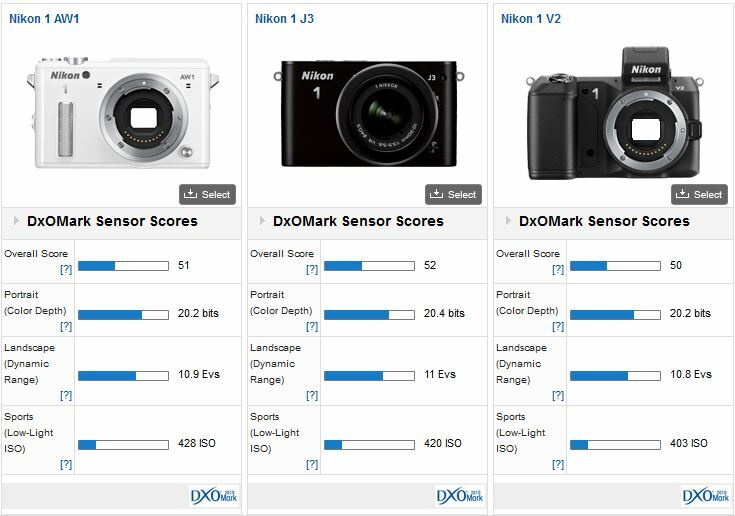 The overall score is good for a Nikon 1 system camera, as are the individual metrics with a color depth of 20.2 bits, a 10.9 EV dynamic range and a 428 ISO low light score. But, predictably, the performance is on the low side when compared to other mirrorless formats. Against other current models in the system, the Nikon 1 J3 and viewfinder equipped Nikon 1 V2, the AW1 sensor has practically identical performance, suggesting they share the same 14-Mpix imaging chip. While the AW1 is a unique proposition for the time being, rivals can be used in dedicated underwater housings and, while they’re expensive, it’s still appropriate to compare sensor quality. At $599 complete with 14-42mm kit lens the tiny Panasonic GF6 has slightly higher pixel count and yet compares closely in performance to the Nikon. The AW1 has around +1/3 stop wider dynamic range, but the GF6 has +1/3 stop increase in color depth and ½ stop benefit in low light. 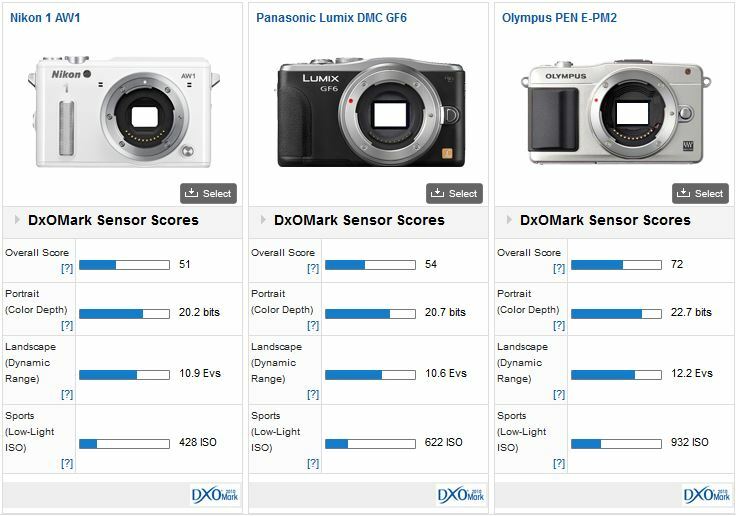 Compared to the competitively priced Olympus Pen E-PM2 (just $499 with 14-42mm kit lens), which also sports a sensor with a similar pixel count to the GF6, the AW1 really struggles to compete. The Nikon has -1.67 stops lower color depth, -1.3 stop narrower dynamic range and a substantial -1 stop disadvantage in low light. While it’s somewhat disappointing that the sensor in the AW1 is the same unit found on the Nikon 1 J3 and V2 models, it’s not really surprising. Given the competitive price, which is less than most dedicated underwater housings, the AW1 is an attractive option for thrill-seeking outdoor photographers, and it’s just as home on the beach in the summer. Adopting an extended mount, with twin-seals for the new lenses while retaining compatibility with the original 1 Nikkor lenses, was a clever yet crucial solution, greatly expanding the AW1’s flexibility and potential popularity. As such, the AW1 is an intriguing reinvention of the system.